July 29, 2015: You and your damned empathy! Congress voted they can take anybody's US passport any time without a hearing! Watch out now! 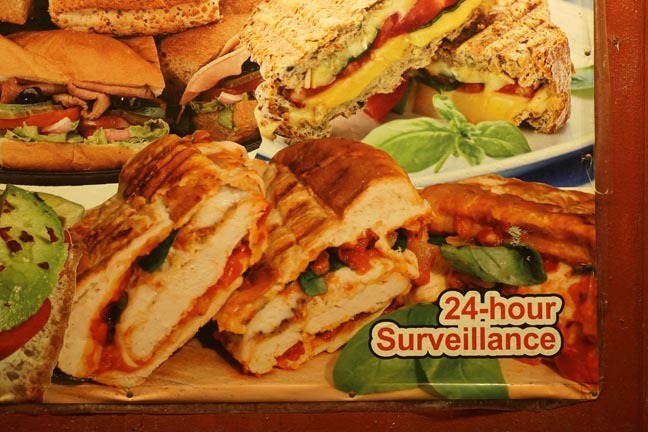 Surveillance with avocado or surveillance with bacon? You really have to watch those avocados. They're mostly from Mexico, and you know what that means. When Mexico sends its avocados, they're not sending their best. They're sending avocados that have lots of problems. They're bringing drugs. They're bringing crime. They're rapists. And some, I assume, are good avocados. Eternal vigilance is the price of guacamole. Ah...Small Change the Tom Waits album, not $mall ¢hange the DJ. Is the idea that the 2 cut sandwiches look like faces? Apparently no one knows how to respond to your question. I, for one, am flabbergasted. @ Robert--it's inexplicable; a deli in the West Village put that sign up on the side of their building and I snapped photo of it. All I can say with any certainty is I would not do anything weird in front of those sandwiches. Every bite you take ... every slice you make ... they are watching you. Your diet is watching YOU. Turnabout is fair play! If you can't do anything weird in front of a sandwich, then what can you do? W. Neil: I read somewhere they're a cross between Zappa and Sun Ra. That seems apt. And what do Zappa and Sun Ra have in common? Tom Wilson. And Tom Wilson loved sandwiches. Full circle. And Tom Wilson's favorite color was orange -- like the meat in them samwitches. This Stephen Fierce is really, really good. Thank you. I vaguely remember hearing it before, but I have no idea when or where. Phat: Been airing a lot, it's new (OK, I lied). Probably hard to find, it doesn't even have a bar code. But some great stuff. He was influenced by R. Stevie Moore and Ariel Pink. Ah, that makes sense. This Humphreys and Keen is really good, too! Nothing speaks better to race relations in the world than a high functioning German musician singing “Ebony & Ivory” off key. @anonymous coward: That’s an extra 50 cents per sandwich. Irwin! I received that marathon prize that you autographed...it's still in the ziploc bag, tacked to my wall. MONEY: what was it? Memory fails. Wow, I really enjoy Clay Pigeon's music creations even though I don't dig many of his musical selections as a DJ. Ken played the same w/o the music this AM. This part sounds familiar, but I didn't hear the music on Ken's show. This gets better the longer it goes on. I wanna go to Shakeys! Ava: Far as we know, Clay is fine. Some of us are just discovering his marathon CD bonus disc. Ahh, ok. That makes sense. Thanks! I didn't get that. I didn't know to get it. No one told me "you must get this". That Clay track was funny but it made me very uncomfortable. It was very Bob and Ray or Vic and Sade. That was like a non-insulting, non-condescending, actually funny version of Prairie Home Companion. So, not like Prairie Home Companion at all, really. More from Hans Fenger? I don't have this either. I got my big box of stuff a week or two ago. It wouldn't have been a box except there had to be room for that big book (first prize I ever won during a marathon). Hang in there, Ryab and chris, we're sending every day! Took a break from my Waikiki walks to hear the show.....walking two miles to Diamond Head and over the shore......never triple digits.....90 every day.....water is 82.......still unrelenting tropical summer heat......had to take a walking break....just burning up.......Yo Iriwin & the gang. What time is it there over there in the islands? Got my swag a few days ago. Thanks volunteers, thanks Joe McG, thanks Scott W. et al. 10:45 in the morning......Irwin starts here at 9am......Ken at 3am......i go on east coast time....imagine Sunday MORNING football.....drives you nuts..
@Joe McG: Thanks for chimin in Joe! This was my first marathon so I don't know the drill. Thanks for the reassurance. Bob and Ray's comedy was so ahead of its time. Still hilarious. I saw Bob and Ray do this bit and many others at Carnegie Hall in 1984, right after I moved to this fine metropolitan area. Very memorable. I must confess that I sometimes have mixed feelings about Brian's stuff, but I'm warming to it. This is great. My parents loved their humor. So much of my parents interactions seemed like a Bob and Ray routine. I don't know for sure if that's a good thing. Friends-of-Dewan Life in a Blender will perform this Sunday, 7 pm, at the Goat-Stock fundraiser at the Jersey City Harsimus Cemetery. Come to the Monty Hall show, RRG. It will be most entertaining and droll. It's definitely a good thing, Rich. Thanks to rrg for the Bert. I have a big warm spot for Bob and Ray. They were pretty much the only thing on radio *mumble* decades ago which my dad and I both enjoyed. Years after their heyday I did listen to Bob and Ray albums (they made a few) in my Dad's presence and he really loved what he heard. I think that, strictly speaking, a "ballad" has words. But I know what you mean. Also, I could be wrong. Also, LL, a better wordsmith than I, is here today and might speak to that. Ballad is a slow tempo that teenagers find boring. Those are the tracks often skipped. I speak as an ex-teen. Thank you, Mr. Irwin, for another fine program today. Thanks Irwin. Time to turn off wfmu. You could've mentioned WFMU's affiliate program w Amazon, Irwin. This is different from dead air. I'm sure it is. I'm going to hazard a guess that tonight's secret word is "no show."